It's time to throw down with the navy using your hand-picked crew of noble pirates - or something like that. I'm not super familiar with One Piece, honestly. But One Piece Thousand Storm is just that: beating up navy baddies and expanding your crew of lovable miscreants. A pirate captain is nothing without his crew. Use medals to acquire new characters and upgrade current ones. You earn character medals by completing missions. Once you have enough you can spend a bit of coin to use them to recruit someone new - or if they aren't new you can enhance their stats instead. Always equip cards. 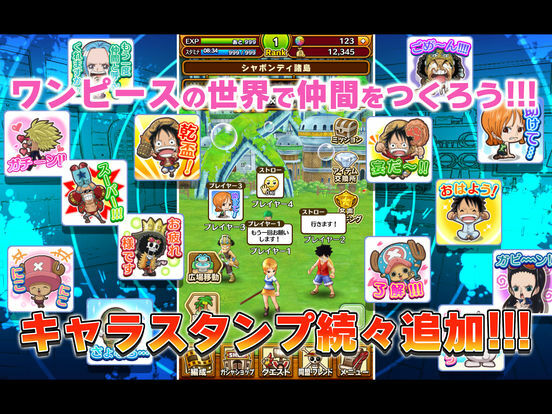 Each crew member can equip 4 cards to start, and that number increases as you enhance them with medals. 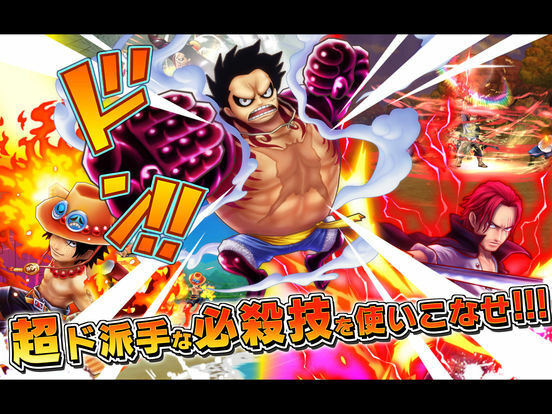 Cards that match the crew member will often give them new combat skills, but even mismatched cards will increase their stats so long as they're equipped. Upgrade your cards. You can use duplicates, unwanted cards, and other special items to increase a card's level - thus boosting the stat gains and potentially increasing the potency of its associated attack skill. Position matters. Most combat abilities have a specific area of effect. Know what these are, and try to move your crew to a good spot in order to maximize effectiveness against groups of enemies. You can switch between your two active crew at any time. Use this to your advantage and call upon crew with the best skills for a given situation when you can. Be aware that there's a cooldown for crew that have been swapped out, though. Mind your energy. Special abilities have a cost, and if a character runs out of juice they won't be able to use any of them. 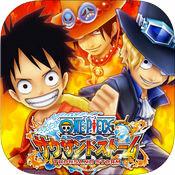 One Piece Thousand Storm is an okay game that puts a popular license to decent use. It's not likely to win anyone new over, but it should please the fans. On Piece is the kind of anime that I've always had trouble starting. I know it's popular, and I know it has quite a few fans, but I've just never been able to put the effort in to checking it out for myself. There are likely a lot of references in One Piece Thousand Storm that I just didn't get, and I'm only mildly familiar with a handful of characters, so feel free to take my comments about the plot with a grain of salt. That said, it also didn't suddenly make me want to binge watch the show, either. As always (I think), there's an over-arching story involving pirates and legendary treasure. You, as the faceless, almost ethereal protagonist, get to decide which of three locations you want to be your home in order to determine your loyalties and your starting crew. Then it's off to beat up the navy, because getting into over-the-top anime fist fights on dry land with a militarized force that's supposed to be all about boats and the ocean makes sense, I guess? I'm fairly sure that even if I were super into the show I'd have nothing nice to say about the story. You don't have to be familiar with any of it to see how completely unimportant and by-the-numbers it is. The script follows along the unwritten freemium tie-in game checklist pretty consistently. A notable character just happens to stumble onto you, another notable character provides lazy exposition on how you have to DO THE THING, tutorial, first notable character asks for your name, and so on until you either fall asleep during the cutscenes or just start skipping over them (do this and you'll likely enjoy the game a bit more). Lame shoehorned story bits aside, even my limited knowledge self can see that there's a pretty big roster of (presumably) popular characters that you can add to your crew. When it comes to beating up the navy, well, it's largely hands-off. Your active crew members (you can have several characters but only use two at a time) will wander around the battlefield and attack enemies autonomously. You can tap on enemies to target them, tap a location to move to that spot (they'll start moving on their own again as soon as they reach it), tap to switch between your two crew members, and tap to activate special skills. This probably sounds like an issue but to be honest I actually prefer it to what I imagine the alternative would've been: awkwardly moving around with a virtual stick and mashing a virtual button to attack until the gameplay becomes more tedious than the story. At least with this less direct control approach you can usually ignore the mundane stuff and focus on the strategy of character placement and skill usage. I find the menus and non-action elements to be more of a problem, honestly. While the combat is simple but entertaining for what it is (and also mildly strategic), character management is a pain. For one thing, menus are the same sort of jumbled mess of too much information that's not as important as it wants you to think it is that you'll find in lots of free-to-play games. Then there are the scene cards. These are basically stand-ins for equipment that you can attach to your crew members in order to boost their stats as well as unlock new combat abilities. It's not a bad system so much as a pointlessly convoluted one. Some cards unlock the same ability for some reason, despite being different cards, and you can select whichever version of that ability you want but until you upgrade a given card enough neither one will be better than the other. But sometimes the skill will improve for some reason. And you can equip cards meant for other characters in order to get the stat boosts but you won't get any new abilities from them. I dunno, I mean I didn't have trouble figuring any of this out, but I think it could do with a good streamlining. All told, One Piece Thousand Storm is an okay game. The combat is decent enough, and there is some wiggle room for crew customization, but it's difficult to care enough to want to continue when the management elements feel more like a chore or a job than a fun or satisfying thing to do in order to make your crew more formidable. I'd expect series fans to get a kick out of being able to put their own crew of favorites together, but outside of that there isn't anything here that stands out from the crowd.